Movies have taught us wars from so many points of view, in some cases we almost know by heart what happened in particular battles. Also, it was hard to think that a war zone will be able to surprise us by showing us the horrors of those events that brought to light is the worst face of humanity. ‘Dunkirk’ is also one of the smallest films of its director, since its duration is only 1 hour and 47 minutes. It tells us an important episode of World War II known as Operation Dinamo, which was the response of the French Resistance to the Assault of the German army. Before the advance of Hitler, the rebels evacuated the allied soldiers of Dunkirk between May and June of 1940. 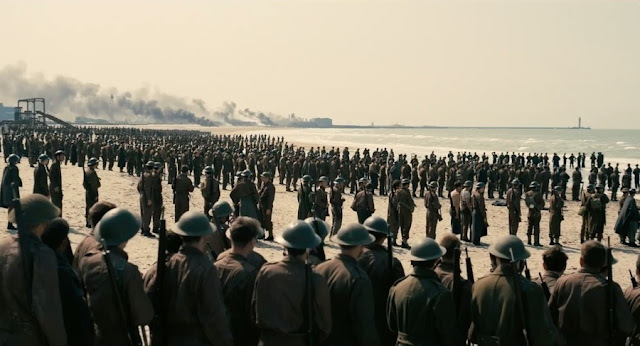 Dunkirk begins with a scene in which enemy forces are trapping Allied troops on the beaches under air and ground cover from British and French troops, with the sea cutting their way they face an impossible situation as the enemy approaches. At the end of this valiant mission, 330,000 French, British, Belgian and Dutch soldiers were safely evacuated. Harry Styles, Fionn Whitehead, Aneurin Barnard, James D’Arcy, Jack Lowden, Barry Keoghan and Tom Glynn-Carney as the cast recounts the horrific World War II battle. In brief, ‘Dunkirk’ is a masterpiece and one of the best film by Christopher Nolan. He wrote the script, told from three viewpoints–the land, sea, and air–to contain little dialogue and create suspense solely through details, and he knows how to hook us from the first scene and keeps on the edge of the chair at all times. While it is not for the average moviegoers – if you’re looking for a fun and silly action flick there are other options around – it is the first real contender for ‘Best Picture,’ and many other technical awards. If nothing else, it is yet another landmark execution by one of the most influential and proficient storytellers in the modern age of filmmaking. ‘Dunkirk’ is scheduled to be released on 21 July 2017 in India.